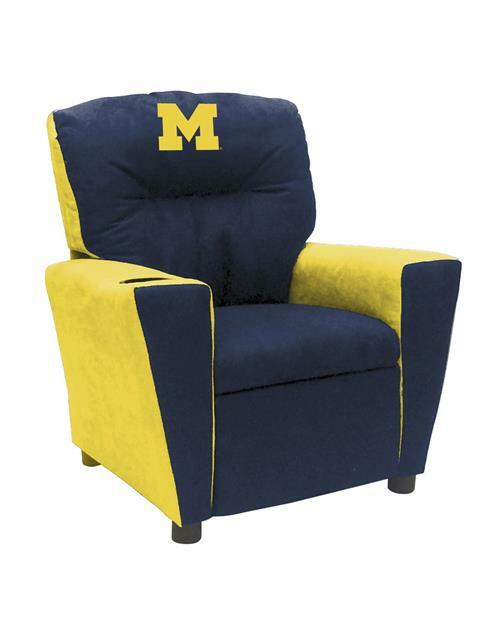 The Officially Licensed Michigan Wolverines Kids Fan Favorite Recliner lets the small fan compete with the adults and show their team spirit. The recliner has a sturdy mixed hardwood frame with steel mechanism with child safety operation. It is covered with durable Microfiber in two team colors with a 5.5-inch embroidered team logo. It even has a cup holder. Designed for ages 3 to 7 and weight up to 75 pounds. Dimensions: 24.5"x23"x28”. Made in the USA. Ships via small parcel from Mississippi. Please allow 4 – 6 weeks for shipping.